Big Finish: Doctor Who - THE BEAUTIFUL PEOPLE Review | Warped Factor - Words in the Key of Geek. The Beautiful People lives up to its name – it’s a thing of pure, loopy beauty. At least, it is if you’re a fan of Douglas Adams, as you pretty much need to be to appreciate the stories of Season 17, in which period this is very clearly set – writer Jonathan Morris explicitly references Nightmare of Eden as having just happened when this adventure begins. Many people have tried to capture the essence of Douglas Adams, and one or two have actually succeeded (though perversely not Eoin Colfer when charged with writing the fifth High-Hiker’s novel). Gareth Roberts – yes, in his novelisation of Shada and the likes of Boom-Bang-A-Bang. James Goss in his novelisation of The Pirate Planet. And Morris, as it turns out, ten years ago was writing like a fantastic combination of Adams and Victoria Wood (if you’re American and don’t know who Victoria Wood is - bless you, you poor, impoverished folk – YouTube is your friend). The story here is simple – the Jelly Baby-addicted Fourth Doctor has a fixation with proper, greasy, jam-filled, sugar-coated doughnuts, and under the influence of the Randomiser, ends up landing at the Health Spa of the Damned, run by a breadstick-thin orange-skinned harridan. There are resonances throughout the story – there’s a touch of Paradise Towers in the spa’s deadliness, with seaweed wraps that would give the Fury From The Deep a lolloping run for its money, whirlpool spas with real whirlpools, cross-trainers that are very, very cross and ‘BurnBots’ forcing fat people on runs. Even in itself, that’s delicious satire, but The Beautiful People goes far beyond that. It addresses social and cultural attitudes to fatness and the idea that ‘fat people are just so miserable.’ Certainly it doesn’t help those of us who qualify as obese that thin people tell us we’re all so miserable, but more or less when you say that sort of thing, we have a tendency to want to smash you in the face with a cake and tell you you’re the miserable ones. There’s a happy fat woman here, Sybella Bing, who becomes Romana’s companion for the space of this story, while the Doctor and K9 are AWOL in search of quality sugar-and-grease-based comestibles. Morris’ script drips with Adams-style humour and is set in the kind of universe he used to create. Romana is very firmly front and centre in the story, and Morris has her take several glorious swipes at the show, its conventions and its occasional silliness – it’s that kind of self-awareness of silliness that Adams and Graham Williams brought to their seasons: Romana here has K9 throw in an ‘Affirmative’ ‘because it was his adventure too,’ and pretty much describes the tin dog as an intellectual snob, refusing to acknowledge that he knows the word ‘mooch’ but entirely comfortable giving a Wikipedia-style breakdown of art history at an inappropriate moment. There are gags about retired TV producers, the Doctor uses a highly significant towel to partially defeat the villain, and Romana gets her Pertwee on with some savage reversal of the neutron flow to do the big thing that finally, properly defeats the villain. The interesting thing is that the villain here doesn’t really see what they’re doing as wrong – and what they’re doing, by the way, goes deeper than mad machines and extreme exercising. In fact there’s a touch of the Davrosian ‘Great Healer’ principle from Revelation of the Daleks here that, if you dare to think about it, sends a shudder down the spine. But they put their case well enough to make you consider how we as a society see obesity, as a social illness, as something that ‘disgusts’ the ‘beautiful people,’ and something that of course drives a multi-billion dollar industry based largely on fat-shaming and the societal writing of norms of that disgust. That means Morris has written a Douglas Adams-funny script that manages to also do the thing he did that no-one ever notices because they’re laughing so hard – it makes a valid point. It makes you think while you’re chuckling. What’s worth at least as much as that is Lalla Ward. On her day, Lalla Ward’s take on Romana is a unique companion – more than the Doctor’s equal, she’s able to be more irritated with him than almost any other, but she approaches the relationship between them from a different perspective to her previous, Mary Tamm incarnation. Tamm’s Romana was there to do a job. Ward’s has chosen to stick with the peripatetic, childish, brilliant, infuriating Fourth Doctor, using him as her ticket to see more of the universe before having, eventually, to return to Gallifrey or find an alternative path, and so she finds ways around the Doctor, humouring him when necessary, diverting him when possible, and even going on adventures that aren’t really adventures (after all, here they use the power of time travel to go and get some doughnuts because the Doctor pouts that it’s not the same if you have to make them yourself, and because K9 always uses the wrong sort of jam), simply to broaden her ultimate experience of the universe in all its shades and wonders. The Companion Chronicles, if they had a fundamental raison d’etre, existed to show us more about the character of the companions than the TV show ever had the time to do, and The Beautiful People succeeds in fulfilling that potential – it shows us this thirst for adventure and experience in the Second Romana, and, by very much being a story in which she engages and defeats the villain, it shows us that she’s by no means the wide-eyed, uptight gullible academic she was at the start of her time with the Doctor. Yes, she gets into situations that are still sometimes beyond her, but here, she handles them, she deals with the reality of the universe and its villains in her own way. 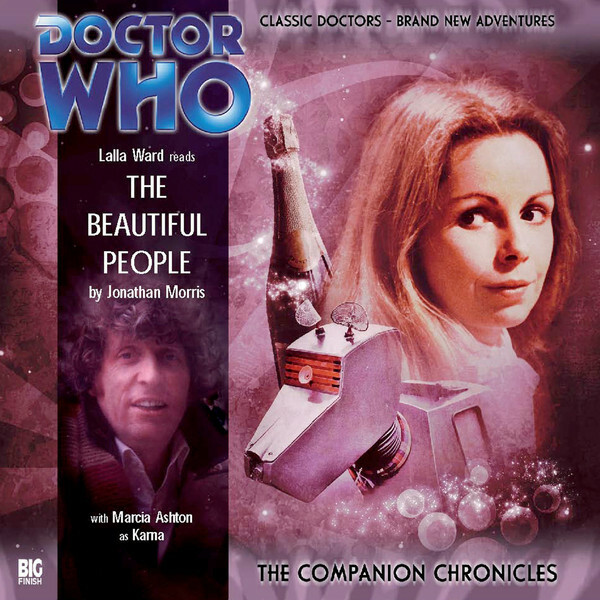 In The Beautiful People, what you get is prime, perfect, utterly en pointe Lalla Ward, seeming to thoroughly enjoy herself, as well she might, given that the script serves her version of Romana hugely well. Giving Ward enough meat to really get her teeth into and letting her fly gives you a Romana story that delivers on every level – the comedy, the drama, the underlying point – and marks itself out as a high point of the Companion Chronicles range. If you’ve never heard The Beautiful People, get it now – it sits alongside the best of the Companion Chronicles, with the added bonus of enthusiasm and a sense of grinning joy, which stories that are solely or mostly dramatic can’t give you. Go, be one of The Beautiful People, not by virtue of how thin or how pretty you look, but by virtue of the smile this audio story will slap all over your face.